Makeup Revolution Strobe Highlighter in Holographic Lights & Vivid Baked Highlighters in Radiant Lights and Peach Lights. The Makeup Revolution Strobe Highlighters are 0.26 oz of product, and Vivid Baked Highlighters are 0.375 oz of product with both retail for $6US and $7.79CAN at Ulta. 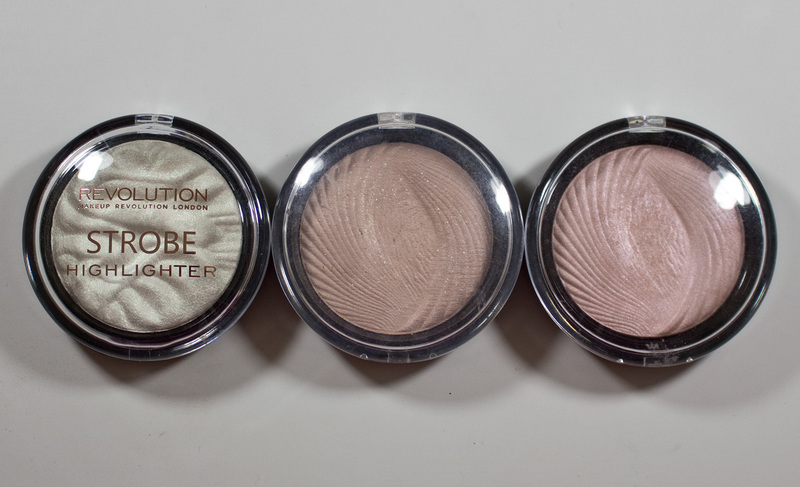 The Makeup Revolution Strobe Highlighter and Vivid Baked Highlighters formulas are firms packed baked powders with a fine satin/pearl base with shimmer. 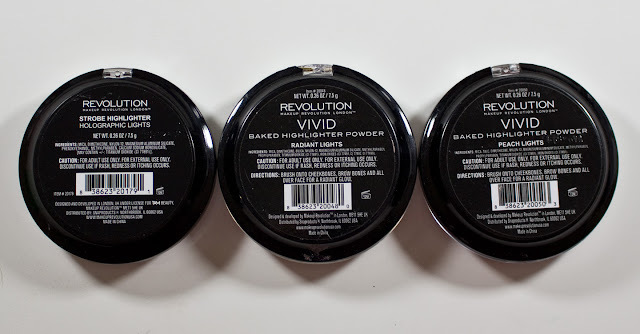 These are powdery which is a trend of most baked powder are on the dry side regarding the hold on the skin. Strobe Highlighter in Holographic Lights is a yellow shift green-white with a shimmer finish with larger random shimmer particles. Vivid Baked Highlighters in Radiant Lights is a warm beige with a shimmer finish. Wear: These lasted 6 hours on bare skin. Definitely works better over foundation and other products to bind these more. Packaging: Black plastic compact with clear lid. Daylight swatches: Strobe Highlighter in Holographic Lights, Vivid Baked Highlighters in Radiant Lights and Peach Lights, applied heavy and buffed out. 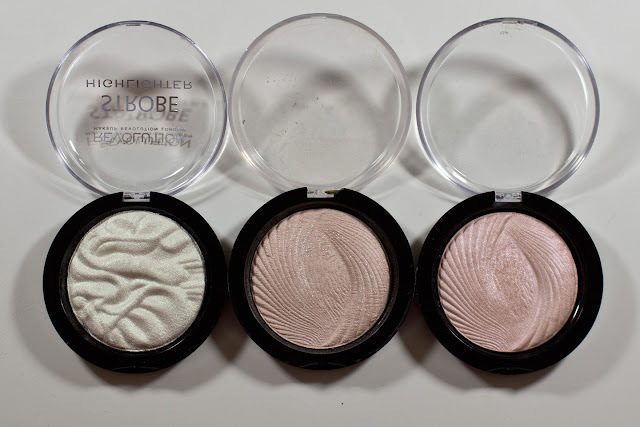 Flash swatches: Strobe Highlighter in Holographic Lights, Vivid Baked Highlighters in Radiant Lights and Peach Lights, applied heavy and buffed out. These are ok, out of the 3 shades I have I'd recommend Peach Lights which does add a nice glow to the skin. As Radiant Lights is kind of subtle and Holographic Lights is too glittery to be natural looking at all as the base colour sheers out.